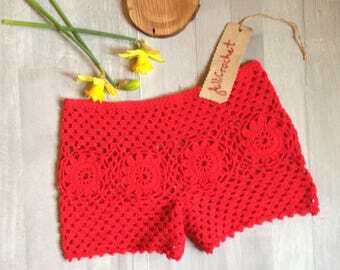 Red bikini, crocheted, designed by MillyCrochet. For your super on-trend look on beach holiday, this red bikini is the best choice. By quality and unique design this crochet swimwear will reflect your exquisite taste. And command attention on the beach, poolside. Made of high quality organic cotton, Italian. This model is ONLY available in red. I can design for you especially something unique in different color. This bikini is made very tight and I am sure will be on the place wet! Choose size of the bottom and top, separately, in drop menu. Please, after the order, convo me, to make decision about details: length of straps, additional details, also you can pay for EMS (express mail shipping). Cold water and very mild, plant-based detergent. Only hand-wash. Washing it in a machine will stretch the bikini out of shape. Lay it flat to dry over a clothes rack or anything that will still let air circulate around it.